This innovative volume is the first collective effort by archaeologists and ethnographers to use concepts and models from human behavioral ecology to explore one of the most consequential transitions in human history: the origins of agriculture. Carefully balancing theory and detailed empirical study, and drawing from a series of ethnographic and archaeological case studies from eleven locations—including North and South America, Mesoamerica, Europe, the Near East, Africa, and the Pacific—the contributors to this volume examine the transition from hunting and gathering to farming and herding using a broad set of analytical models and concepts. These include diet breadth, central place foraging, ideal free distribution, discounting, risk sensitivity, population ecology, and costly signaling. An introductory chapter both charts the basics of the theory and notes areas of rapid advance in our understanding of how human subsistence systems evolve. 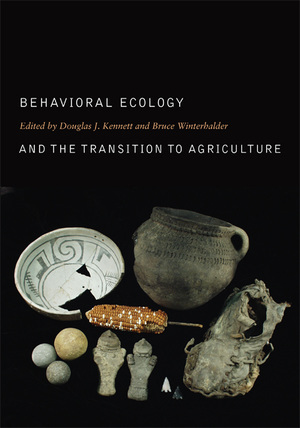 Two concluding chapters by senior archaeologists reflect on the potential for human behavioral ecology to explain domestication and the transition from foraging to farming. Douglas J. Kennett, Associate Professor of Anthropology at the University of Oregon, is author of The Island Chumash (California, 2005). Bruce Winterhalder, Professor of Anthropology and the Graduate Group in Ecology at the University of California, Davis, is coeditor of Evolutionary Ecology and Human Behavior (1992) and Hunter-Gatherer Foraging Strategies (1981).